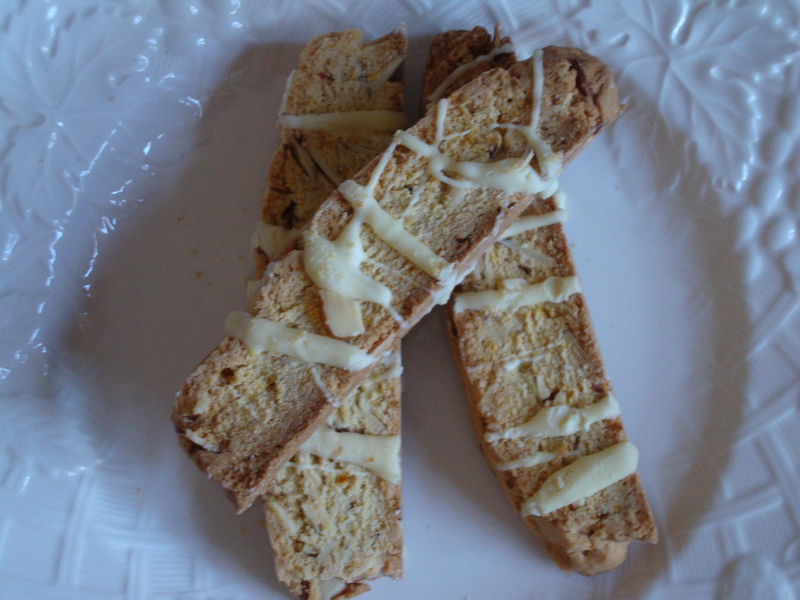 A mild variation on hazelnut biscotti, but this time it’s a cup of silvered almonds instead of hazelnuts, plus 2 tsp. of Gran Marnier ( or any other orange flavored liqueur or extract), and 1 Tbs. of freshly grated orange zest to infuse the flower with delicate orange flavor. A pinch of additional flour may be necessary to avoid the consistency of the dough from becoming overly soft or sticky. Melted white chocolate, simply piped from a plastic Ziploc bag add a touch of gourmet and decadence. I wonder what biscotti will come next? I will take suggestions!